Here is the free sample earthbag plan from Precision Structural Engineering. Preview the Economizer House Plan here. Preview the Solar Pit House plan here. Preview Desert Shelters by searching this phrase in the built-in search in the right hand column. Preview the Craftsman plan here. View and download complete complete plans at Teach Democracy.org. Want to see more plans? My Earthbag House Plans site has about 130 plans. Most cost only $200-$300 and can be ordered from Dream Green Homes. I love all of these ideas. What brought me to this page is a aircrete website. The solar pit house design, can aircrete be used in this design? I think that aircrete would be an excellent choice for building the walls of this design. I wat to build first a 120 sq feet dome, and then ask for addition ( the permit is sky high). I will need a plan sealed by an engineer. I will do it in Joshus Tree California, and per assessor, it needs to be sealed. First you need basic architectural plans like mine or CalEarth. If you buy through me you need an engineer. Right now the only engineer I know of for sure is Structure1.com. 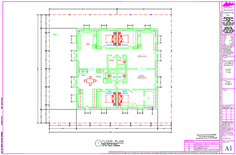 They can create the full blown engineered plans and get it code approved. BUT it will be costly due to all the codes and earthquake risks. I would like to build an earthbag house using scoria for the bags’ contents and using scoria or gravel as footings. I would like to use the earthbags for retaining walls and step the house down the hill, rather than excavate a large cutting into the hill. Do you have any links detailing how to step the footings for earthbag walls down the hill, using gravel/scoria as footings? I am assuming that I should use some concrete to form the steps and then place the scoria bags over the concrete steps, bonding them as the wall goes over the step. There’s an article here on our blog that explains how to build stepped foundations. It’s easier than you imagine. Use the built in search engine and search for Stepped Foundations. We have thousands of pages of free content here and on our other websites that explain everything, including step by step videos. If you’re going to build with loose bags of scoria, be sure to check out our previous story on the Scoria Casita. He explains how to stabilize the walls. Hi Owen l have a project on a island near kaolak in thailand . l like to make some domes as room can l use sand or better use rice straw….? Did you still live in thailand? Did you still make dome with your new product ? Yes, I’m still in Thailand. We’re not building now though. We’re focused on expanding the garden — about 1,000 more bananas, papaayas and fruit trees. Sand will shift and cause the dome to collapse. Go to EarthbagBuilding.com and read the free dome building info there. You can use sand or sandy soil if you add cement or lime to stabilize the mix. I have experience build home with earthbag. The reason … it’s pretty simple actually. Another is that it’s affordable. I bought 3000 grain bags and still have quite a few left over for some other projects. All were pretty cheap to buy and easy to build myself. From now on if you interested in possibly building your own home, it can be done by yourself. If not.. you can pay contractor to build your home. I am looking at land in Virginia and am in need of a floorplan for our earthbag home but the ones on the website are not exactly what I’m looking for and I don’t want to trust anyone else to design it due to the specific dimensions of the earthbag. I wonder if there is a designer on your staff that could revise or edit the torus design for me? Can I contact via email or by phone to do this? I’m the designer, ha ha. And I no longer do custom plans. Buy the CAD files then hire a local architect, home designer or engineer to make final changes. They will know all the local codes, soil conditions, etc. Dear Owen, we have an old flat bottom, metal, grain silo about 5 metres diameter. It has a conical roof. We live inland in the south island of New Zealand, very cold in winter, very hot in summer. We want to make a living space for people in this silo. We want to avoid building internal framing but want to insulate, we don’t know how to attach insulation to the metal walls. We were thinking of sheep’s wool or other natural cheap or recycled materials.Do you have any suggestions, or should we be thinking of external insulation? Thank you for your time and wisdom. Wool is the best insulation material in your area so use it if you can afford it. Plus, insulating the interior will greatly improve the acoustics and livability. Save the steel exterior because it’s designed to weather the elements. So this narrows the selection to figuring out how to frame out the interior for wool. That’s up to you to decide. Typical wood framing is the easiest option. This facilitates mounting doors and windows, cabinets, space for plumbing and electrical, etc. You Don’t need to hire contractors. Anybody can bang 2×4’s together. Or rent a nail gun. Look for recycled wood to save money and trees. Hi Owen I live in Maine USA and the climate is very crazy here, I wan to try and build a hobbit house like the famed Simon Dale house you see all over the internet. Can i use earthbags filled with dirt since the roof is going to connect to the ground? Also for moisture control how can i keep it dry? It gets very humid in the summer and can be extremely wet in the spring. I want to build on a concrete slab, 6 feet below the surface due to frost. What are your suggestions? Greatly appreciated!!!! You are a legend!! The answers are free here on our blog if you keep reading. See my Free Pit House plans under Free Plans. http://www.naturalbuildingblog.com/house-plans/free-house-plans/ Those drawings show how I build structures like this. It’s best to use 24″ wide gravel bags, double bagged for strength, filled with local gravel or better yet volcanic gravel or ‘scoria’ for insulation. Rounded shapes are stronger than straight walls. Use 2-3 thick layers of plastic on the outside to keep water out. Use a French drain, etc. Also read some of my free earthbag articles like this one: http://www.instructables.com/id/Step-by-Step-Earthbag-Building/ Thick timbers can support an earthen roof if you get help from a timber builder. Hi I was wondering how it’s going? I live in Michigan and have some of the same climate issues. Hi! My name is Praveen I want to build a underground house but before building I want to know each and everything about it so please can you help. I recommend reading some really good books about underground housing. One key point is learning how to prevent moisture problems. Another issue is building strong walls that resist the thrust of soil. DO you have any thoughts on the difference between using polypropylene and polyethylene for building? The cost of polypropylene bags is rising and rising as earthbag construction gains momentum. We looked at the cost of PP bags vs. polyethylene tarps which could be sewn to use as tubing. The tarps are around 1.20US apiece but the earth bags are becoming cost prohibitive for us…we will be building in a very poor area (hoping to expand knowledge of earthbag building) and most online earthbag sellers require insane minimum purchases. Its’ enraging to me. Capitalism. Ugh. The fabric must be breathable — allow moisture in the bag to evaporate. Otherwise you will have a ‘dirt bag’ instead of rammed earth in the bags. They’ll never achieve their full strength. Check into raschel mesh bags. The cheapest tubes are from a company in Canada. Search our blog for Discount Mesh Bags. I am in the process of getting my plans together to start an earthbag build in So. Oregon this summer. I’m considering combining a couple of your plans together for what I want, which is essentially an earthbag/earthship based on the Solar Pit House. My question is about interior walls. I had started this idea looking at the Enviro Dome 2 but wanting larger bathroom/closet (or for my needs pantry) space and opening up the front area by removing the circle junctions in front and using a passive solar south window facing wall. Changing those areas on the Enviro layout to straight external sides and leaving the internal curved walls gives me a very similar roof/ceiling plan to the Solar Pit… so far so good. My thinking is that the interior curved earthbag walls will act as thermal mass in a cradling type way. The bows of the 3 rooms will absorb the heat for the space between the south face and their northern areas while the bathroom/pantry areas will be set behind. (I have mocked together a version of this you can see here). Is my theory correct or am I making additional pointless work for myself with this design? Very interesting! This can work. Be sure to start with something small first to develop your skills. Structure1.com can get your design finalized and code approved. Yes, it’s actually called earth plaster. Same materials as cob just different ratios and consistency. Thank you for that info Owen! I have heard of the fungi insulation but the only company I know (ecovative) is not quite ready for selling their product yet. Could you tell me the one you know? We would really like to stick with natural products if we can. So, if we were to fill the bags with perlite or vermiculite would that be load carrying? Could we just pile the sand up to the top on the outside or would it need an extra vapor barrier? Or, if we were to use your Earth Lodge plans – the load would be resting on a timber structure, right? There are lots of variables and so it’s hard to give you definitive answers. The best choices largely depend on your climate, the plan you want to build and the code situation. In a cold climate like Canada you want LOTS of insulation. Ideally you could get scora, pumice or something like expanded clay granules or foamed glass gravel that have higher load bearing capacity to reduce risk of settling. This is important if you choose a plan like the Earth Lodge which has partially load bearing earthbag walls. The post and beam frame only carries half the load. A vapor barrier around the perimeter and under the floor is a good idea in wet climates. Not sure what companies sell fungi board at this time. Hi Owen, we are hoping to build a long lasting home that can withstand rough, cold climates and use very little energy, while supporting most of our needs. The Solar Pit seems to meet a lot of those requirements. One big question for us is the use of materials, as I am highly sensitive to various chemicals, VOC’s, etc. Could you recommend some natural insulation materials that could replace rigid polystyrene? Your advice is much appreciated! There’s a natural fungi insulation board that’s been on the market a while. Not sure how good it is. It’s probably more expensive than other insulation boards and may not be readily available in your area. There could be other products available since I last looked about two years ago. Search for natural insulation panels or natural insulation boards. Insulation boards on the outside of the home should have no detrimental health concerns for the inhabitants, so any type of below grade insulation board should work. They’re not natural products, but they will greatly slash the energy use of your home, so they are sustainable in that sense. Owen, my husband and I are planning a move from AZ to OK in a couple years to be closer to family. We plan to build an earthbag home. The house we live in now we built and is Rastra so we are extremely excited to try earthbags! I’m curious about your opinion on what type of home to build. We would love to build domes verses the roundhouse style, especially for the strength going to OK with so many tornadoes, but I’ve also read that they are the hardest to waterproof. I’ve read many things you’ve written about the domes being ideal for arid climates, not so much wet climates, but I’m not sure where OK would land in terms of this. OK certainly gets more rain than AZ….but when you say wet climate, are you talking tropical or coastal, or anything out of the “arid” realm? I would love your opinion on this matter, like I said, we both love the domes, but would consider the roundhouse style if we think water will be an issue. Thanks! Go with earthbags, but add a roof or rainscreen for greater moisture protection. Be sure to design in adequate ventilation, including venting out the peak. I wanted to start building sandbag house. I have an idea but what kind of wood shall i use? Shall i start with the foundation first and rebar post? How does the plumbing and electricity and the controls run? How do I get the material list as to how many sandbag i need? I am going to build this in Ethiopia. Are there people I need to contact in case I have question? We have 2-3,000 pages of free information that explain everything. You can buy my $20 ebook (see link above under Publications) if you want to save time searching. The book summarizes everything for convenience. Watch my free YouTube videos that show every step. And read our FAQ page for answers to basic questions like How Many Bags Do I need? It takes time to learn something new, but in the end it’s as simple as filly bags or tubes with moist sandy/clayey soil and tamping them solid like rammed earth. Humans have made rammed earth houses for many thousands of years without books. So the basics are very simple. I wanted to build a house in ethiopia. how do you plan for electricity and plumbing? Is it a good idea to build the foundation with cement and the posts with bar? is there step by step instruction to build is ther easy way of finding as to how many sandbags i need? Search our site or buy my ebook. You plan your electricity and plumbing into your house plans, then it goes into the house as you build- our electrical and water pipes go into PVC pipes which act as ‘sleeves’ to keep water out and protect from extreme heat in summer. As to how many bags you need, find one the right size, fill and tamp it, and then it’s arithmetic. You need the square meterage your house walls will cover, and the height. Do you know if anyone has already built and is livin a solar pit house? I really love the idea, but would need some confirmation. Also, do you think solar panels for offgrid electricity could be included for that design? The desert shelters page was really great! The economizer house was good also. We put up a short post about your Economizer Plan on our blog site with some links back. I just wanted to write to you to thank you for all your efforts. You are a doer and a giver and you are changing the world for the better. I watched one of your YouTube videos “$300 Earthbag House” and I was inspired by the beautiful style of the second home. I own ten acres in northern Arizona. I have dabbled with a rain capture and reclamation system and have been interested in a project like this for a couple of years. Where can i get instructions or more information on the second home from that video? The “Option B starter home, with additions”. I would love to tie two of them together with the verandas meeting in the middle to create a central courtyard space to create an indoor/outdoor living environment, while maintaining what appears to me to be a distinctly spanish building style. What type of flooring system is used? Email me for details. My email address is at the top of the page under About Us. You can use any floor you want. Earthen floors are the lowest cost. The earthen floors in Taos Pueblo have lasted over 600 years, and have started gaining popularity among the rich in Santa Fe, etc. due to their unique look and slightly springy feel. They look almost like leather. For your climate, add a moisture barrier and 12″ of scoria underneath for insulation. You’ll want to make some test earthbags to see what works best. You could start with around 5% and gradually add more to each test bag. 10% cement would make very strong earthbags. Allow to dry, cut the bags open and do some simple strength tests. Thank you for sharing Owen! Great designs and well documented. I think in your selection documented here there is something for everyone interested in sustainable buildings. Thanks. And thank you for sharing your great ecoresort videos in Panama. 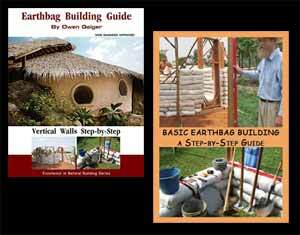 I have been reading up on earthbag buildings and find it very fascinating. I live in Nigeria and with the increased incidence of flood and extreme heat, I would love to build my home with earth bags. Where can I find an expert in Nigeria/west Africa? Owen, can you travel? Hi. I took a team in 2009 to Kenya. We built phase 1 of a multipurpose building. I’m leading another team in June 2013 and am seeking volunteers who have a passion for sustainable building. The multipurpose building is for a Maasai tribe for a church/school/clinic. We had planned to use compressed earth blocks and in 2009 I took two presses there for this purpose. If anyone is interested in volunteering please contact us. I just found your site, and while I tried to read everything, just did not have the time to read all comments. I hope that this comment is keeping with the spirit of your website. Departure from Charlotte NC June 4. 2 weeks–$2,500.00 per person. Includes room, meals, airfare, ground transportation while in Kenya.$3500.00 for 4 weeks, $4500.00 for six weeks. We do not “profit” off of these trips. This is the actual cost of the airfare, meals, transportation, and room. Again, we are seeking volunteers who will help to build a multipurpose building using sustainable materials and methods in the Serengeti for a Maasai tribe. Susan, more people will probably see this if you put it on our Bulletin Board page. See link above. Presently my wife and I are living , by choice, in a tent in national forest and state park camp grounds while we hunt for property. We will remain in a tent until properly is bought and during the time it takes to build. When ever I can get online I am researching off grid living and natural living. I am so excited to have found this site. Our goal is to purchase a small piece of land where we can build a modest earth home and have a farm to provide organic foods for ourselves and to donate to families in need. Presently my wife and I use recyclable items to turn into jewelry and wine bottle incense holders to raise the funds needed to buy property. To be hands on with building our home from the earth is worth every struggle. Great to learn that one can use earth filled bags, I have a country plot near the Victoria falls, Zambia. I hope the council can authorise a small lodge for back packers. Hi Alberto, take a look at http://www.house-of-sand.com – Sandbag building with frames etc….very cost effective and you can be trained to complete the whole process with a small community based team. Some some exciting things are happening in Botswana using this system – a lodge has just been completed in Kasane (northern Botswana) the owners are thrilled and are doing a second using this system. I am happy to provide you with more information. I am just hearing about the earthbag homes and would like to know if the English Cottage would be approriate for the Sapulpa, Oklahoma area? Also,is there a very inexpensive roofing I could use? That seems to be the most costly material that will be used and the cost needs to be as low as possible. Yes, that design would be great. The standard roof in the US uses manufactured wood trusses. Look these companies up in the yellow pages. They’ll give you a free quote and design everything in a few minutes with their software. This method will meet code. Trusses are fast and easy to set. Maybe hire one carpenter to help make sure you do it right. Hi Owen, I’m really glad to see your blog. I’m interested to know more about Bottle houses, I’ve downloaded and read the Free Plan you’ve on the site. Actually, since 2005 Earthquake in Pakistan (I hope you must have an idea), we’ve been proposed many structures and using many as well. I’ve seen bottle houses built in Latin America and Africa over th internet but I need to know if the same is possible in mixed climate of Pakistan? Here in hilly areas, its cold, in plains its modest and we’ve desert too. I wanted to start up a project in an informal settlement in city, but need to know more about it. As i discussed wtih many civil engineers here in Pakistan, they either fail to understand my point of view or just give up saying its not sustainable. can you please give me answers that can satisfy those engineers secondly, how to satisfy the building control authority on the same things. Bottle houses would tend to break apart in earthquakes. Far better to build with earthbags and/or straw bales. There are strawbale and earthbag projects in Pakistan that you can learn from (free info online). Dear Owen, thanks for the reply. Well, earthbags houses are built in areas affected by earthquake. I’ve seen the reports and read the articles about it. I’m interested in bottles house sustainability in climate of Islamabad in an informal settlement of IDPs / Afghan Refugees. Please note that this is informal and temporary settlement. We are a Voluntary organization, run by students. we have been working there for Education. Now if we need to build a small school there, we can’t afford any formal, traditional building because its too expensive. However, availability of Bottles and Mud is very easy. I’m still willing to see that happening in Pakistan. It will help us providing educational and health facilities in such areas…. Bottle walls could work. But make sure you create an accurate budget for the entire structure. The roof is often the most expensive, difficult part. And the walls will likely need posts. You’ll want some professional help since it’s a public building. Thank you very much for such a prompt response Owen. Yes, I totally agree for a professional help required. But, as a matter of fact, the builders/contractors here don’t know about Bottle House/Walls. we need to discuss it professionally with them. Its like, we have to bring something new and need to show them. so far, only one civil engineer liked to work on the idea…so, we would be highly grateful if you can help us in this regard. plz. Can you get used sand bags or rice bags? It will be way easier to build something stronger with earthbags. If you definitely want to use bottles, do you have money and material for post and beam and the roof? Yes, actually the roofs are “Ready made roofs” and the booth can be built with bricks. But, it would be even more feasible if we can use used plastic tires with Mud to build the booth. the Ready made roofs are widely used in Pakistan. It sounds like you’re describing pre-cast concrete flat roofs. That will work. What are booths? And when you say plastic tires, do you mean rubber car tires? How do plan to use tires? Take a look at http://www.house-of-sand.com – A very sustainable and easy to build system that is good for earthquake prone areas. (Tests were done in California) Great for a community based project as the system can easily be taught and is very cost effective. Engineering, Structural, Water penetration and fire tests have been done and the system performs extremely well. Engineering reports are also available. Let me know if you need more info – it will be a pleasure to assist you. I love the hobbit houses, they always seem to call out “welcome! Come on in!” Although all of the various shelters/homes built are so wonderful! (Especially the recycled product ones! Thank you so much for all you do. I hope someday I can learn how to build with the materials that are available in MN, and have a year-around tiny home. One is never to old to learn if they believe strong enough, right? That is what I am counting on! The easiest, fastest way to build in cold climates is strawbale construction. See the book Serious Straw Bale that focuses on building in cold climates: http://www.chelseagreen.com/bookstore/item/serious_straw_bale/ Anybody can do this! We stacked the bales for a Habitat for Humanity house in less than one day. Post and beam is good if you have codes. Wrap the bales around the outside of the posts. Use gravel bags for the foundation with insulation if you don’t have codes (see “frost protected foundation guide on the Internet”). Pay a carpenter to set the trusses and sheath the roof in one day. Pay a carpenter if need be to add the metal roofing on day two. And then you can finish everything at your leisure. 1. how do you deal with roofing? 2. how many year dose sand bag or earth bag house last for? thank you very much for the great valuable idea. You can use most any roof you want. Earthbag construction is similar to rammed earth, which can last thousands of years if properly built. Search our blog for the keywords: ancient rammed earth or something similar. Is there hope for folks wanting to build earth-bag house in the Pacific NorthWest? I know about filling bags with pumice instead of dirt, but, what about making a plaster stucco that survives freeze/thaw cycles without spalling? We are building a sand bag home (solar pit style) – but the only land we can use is very sandy with a water table that reaches the surface in very wet years. There is only so much sand about to raise berms around the house if we build in the surface without creating ponds in the wet season because of lowering the ground level where we colect our building sand. We have thought about digging out an area bigger than the house and lining it with heavy duty plastic, filling in about 3 feet of sand one the floor and sides and putting in a second plastic lining to give a 3 foot dry insulation to stop any cold being passed through into the house when the water table rises. The idea is we still can then have a partially submerged dwelling to keep the temperature even throughout the year – do you have any ideas if this will work (assuming the insulation layer remains dry? Also we thought about a sealed ‘holding’ tank for the black water that gets pumped up to ground level for the french drain system so as to avoid back-filling in those rare high water years. Again, we’d welcome any suggestions – even if only to say “don’t go down, stay on the surface and build berms”. Definitely stay on the surface and raise the building site with something like road base if possible. Water is the #1 enemy of buildings. Berms can be 30″ high. You don’t need to berm the entire structure. Do something similar with the blackwater tank except put it about 2/3 of the way in the ground and berm around it. Earthbag fill: Mix some clay to stabilize the sand and make hard earthbags. Otherwise, you risk building a swimming pool, no matter how much plastic and layers of same are used! Build above ground, and perhaps bring in pumice or dirt to berm that building. You might ALSO want to RAISE FLOOR LEVEL above grade, to avoid wet feet in wet years. Cold, wet feet are unpleasant and destructive of personal belongings! IF one has a site that might flood, it is prudent to go above grade as many feet as generously needed to endure a 500-year flood cycle. I have purchased my bags and want to build an underground or partially underground shelter in Missouri, however I am at a loss as how I should seal the structure; any ideas? Use 2-3 layers of 6 mil plastic sheeting (“black poly”). Build on high ground and add a French drain if possible. I am planning to build a eco friendly ashram in the Himalaya, we have lots of stone there but not enough sand so what you would like to suggest us.This is some information about our place. Thank you so much…. Do you have clayey soil or at least soil with a little clay? That’s the best type of soil for earthbag building. Start with a rubble trench foundation. Add barbed wire between courses of bags, plaster mesh tied together on both sides of the wall, and a reinforced concrete bond beam and lightweight roof and you’ll have a very earthquake resistant structure. Round structures are very strong. Rebar pins down through the bags on each side of windows and doors adds additional strength. Our websites have lots more info on earthquake resistant structures. Use the built-in search engines. We want to help our Philippine in-laws by building a house for them. They own a small very uncomfortable house in Las Pinas. But they at least own the lot it is built on. We want to build a 2 stored house with working space downstairs and living space upstairs. The reason we want to have 2 floors is a space matter. Is it possible to obtain information on what the best technique is to built something there (it’s in between existing houses) and maybe know an engineer or craftsman from the Philippines who could assist us in getting the right picture for our project? Two-story structures are more difficult than one-story. Even more so with earthbag because lots of heavy soil would have to be moved high on the way. So one-story structures are more efficient. Also, one-story buildings are more earthquake resistant. If you need to build higher, I suggest lightweight materials on the 2nd story such as wood or bamboo framing and metal roof. Please write a blog post about earthbag building and add a link to our site. Hi Owen, THANK You for these designs which can help so many souls build homes and communities with imagination, ingenuity and heart. Just a small, yet important detail. In the pit house design pdf, additional notes section, your email is the old address which was hacked. Could you please post for us the new address? Thanks, Gail. I’m still using the same email: strawhouses [at] yahoo.com Yahoo makes it harder all the time to access it, but it’s still working and so I’ll keep using it as long as possible. Awesome resource and one that I will be passing on to my house hunting son. Cheers!